I think we’ve all seen photos of ranches with hide rugs. I live in Texas, so I’ve been around them a lot. They are like cowboy boots around here; they are part of the landscape. Our farm is surrounded by cattle ranches, so it makes sense they would be in style here. But what about in other areas? And more importantly do they go with Country French decor? 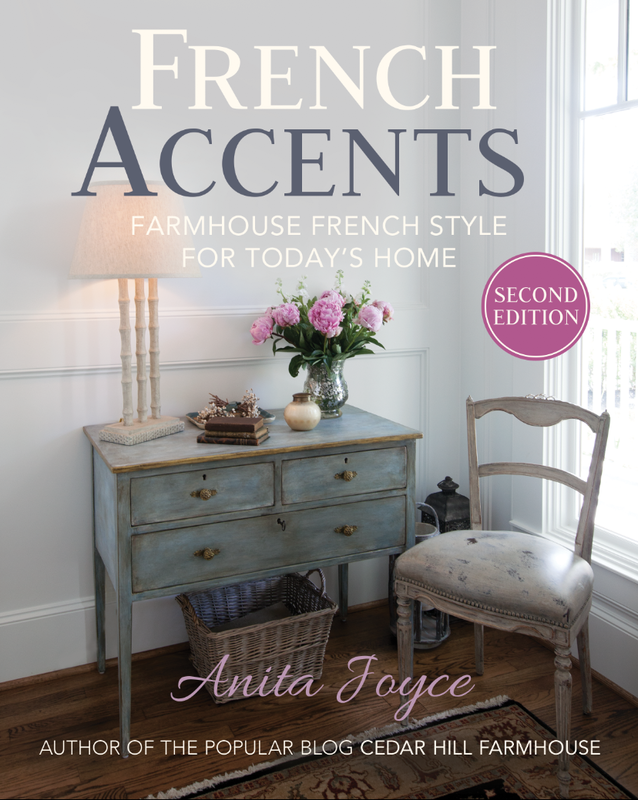 Well I have my own take on Country French that I call Farmhouse French. I see it as an updated take on traditional country French style. Here are the first hide rugs I ever bought. The black did not go with our collie hair. Rule one of selecting a rug is to make sure it is going to hide your dog hair. Well if you have a collie (or other shedding dog) I highly recommend you keep that in mind. Be sure your rug matches your dog’s hair. The benefits to hide rugs are that they are very easy to clean. They are stain resistant. I have never had any stains that didn’t come out. Actually I’ve never had any stains period. I’ve heard it is because of the tanning process and that the hides have a lot of oil in them. The oil repels stains. They hold up well to wear and will last a long, long time. Think about that leather handbag you have that has lasted forever. They can roll up on the ends, so be careful that they don’t become a tripping hazard. They need to be conditioned every 10 years, by applying leather conditioner to the back. Sometimes they can bunch up in places. They have irregular shapes, which makes it more difficult to determine the best way to place them. Now, let’s talk about my farm kitchen. The pine floors are in pretty rough shape thanks to Molly the collie, so rugs also help protect my floors from collie claws. I think it’s a lost cause here seriously. 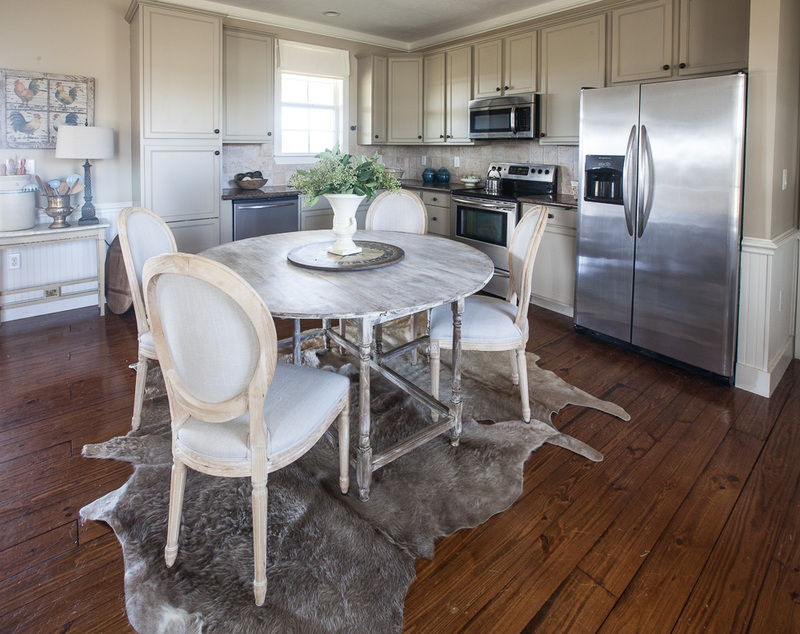 I replaced these darker cowhide rugs for some lighter and fluffier ones. They feel really soft. We’ve had plenty of spills on the other cowhide rugs, but no stains. I think this softer color works well in the kitchen. I know some people were concerned that I didn’t have enough room between the church pew (click here to see post) and the table. It’s hard to see how much space there is in a room from a photo. There’s plenty of room to walk by whether I have the table leaf down or not. There’s Molly peeking inside. Normally she bolts into the house, but it was cool today, so she wasn’t sure she wanted to come in. These rugs are smaller than the other ones. Hide rugs come in many different sizes. The price is dependent on the size, quality and sometimes color. 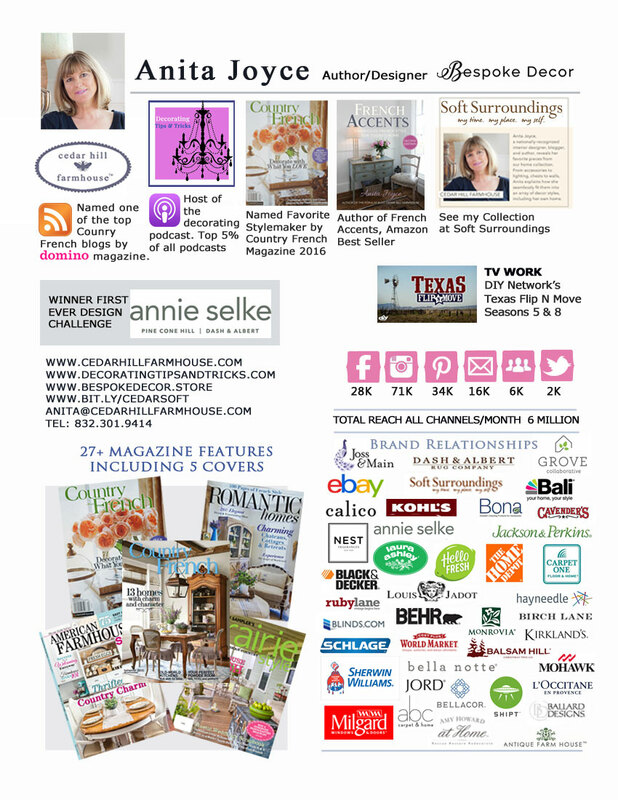 Prices range from $200 for a small rug at Round Top up into the thousands for designer rugs at fancy stores. The green berries are from the farm. The nearest grocery store with flowers is 30 minutes away, so I often have to use greenery I get from the pastures. 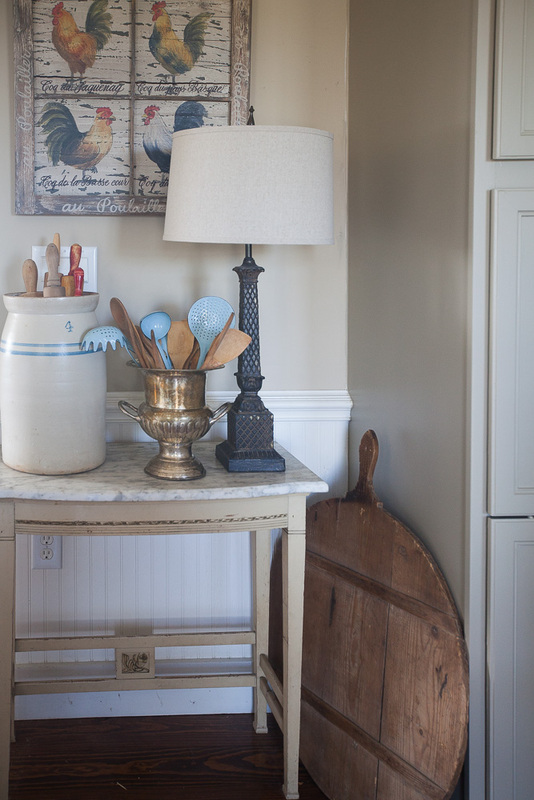 I love this little marble top table in the corner. It’s an antique. 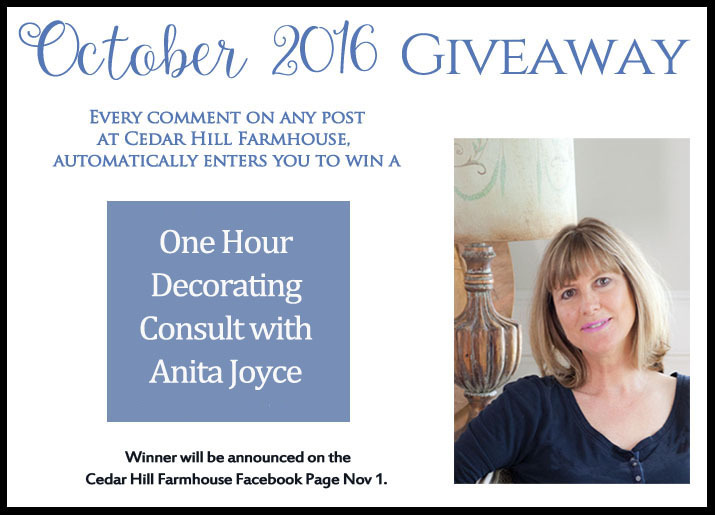 The October giveaway is still going on! 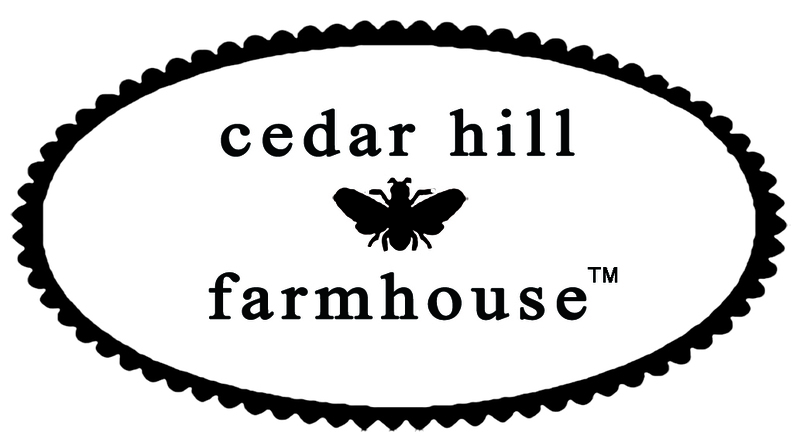 Every time you leave a comment on any post at the Cedar Hill Farmouse Blog, you will be automatically entered to win. Details here. 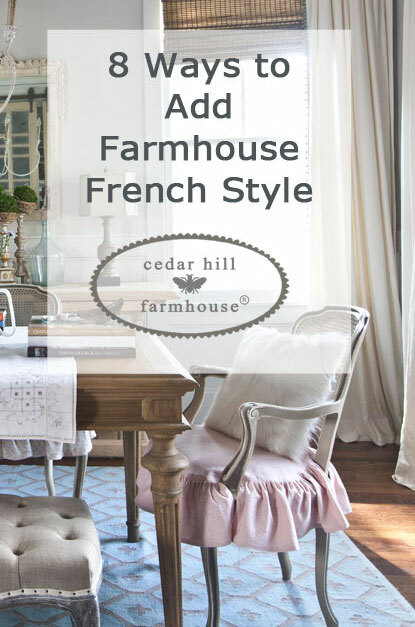 I wish I could change my Tuscan décor to farmhouse French! I love the look. 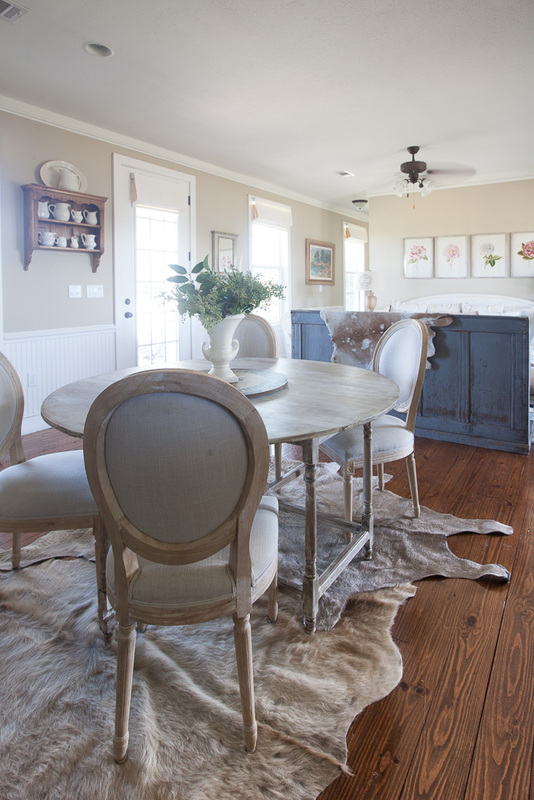 Love the cowhide rug under that dining area!…beautiful Anita! I too have cow hide rugs. I think they’re great in any room. And I love how easy they are to clean. Your comments are spot on about hide rugs and shedding dogs! I put a brown & white one in our son’s entry way of a Hill country style home. This is where his 2 Syberian Huskies ,which shed horribly, run back and forth chasing their balls for the family room. Huge hair balls are all over his house but you can’t see any hair, AT ALL on that hide rug! Absolutely love it there! I told him maybe we should get rid of the other rugs, which hold all the dog hair and buy all cow hides! HA HA! 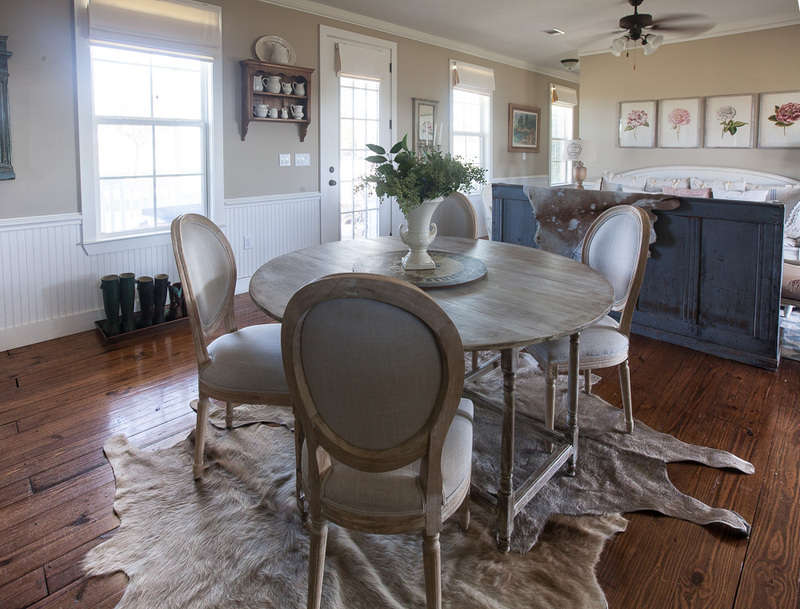 Love the light colors of your hide rugs! And they look great with your country french style. 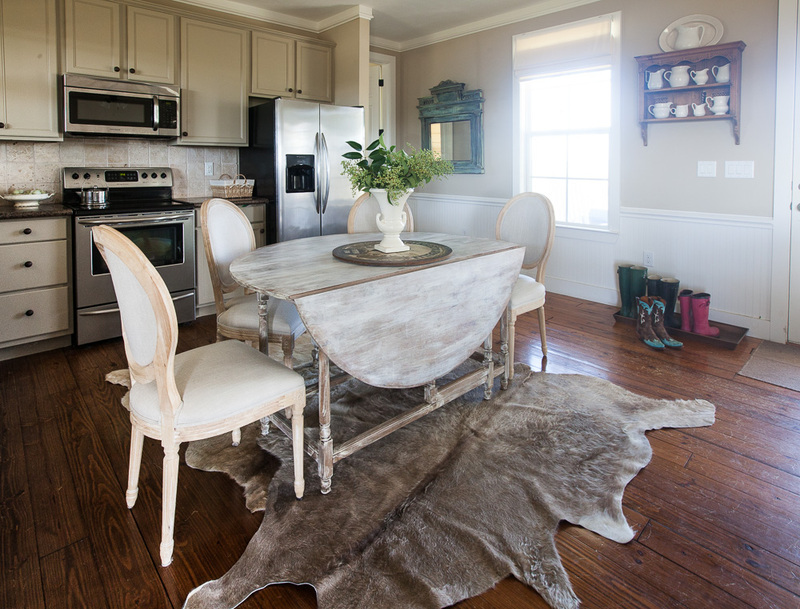 Thanks for this post on cowhide rugs, I love, love love them. But have trouble using them, with your ideas I think I can work on this dilemma. 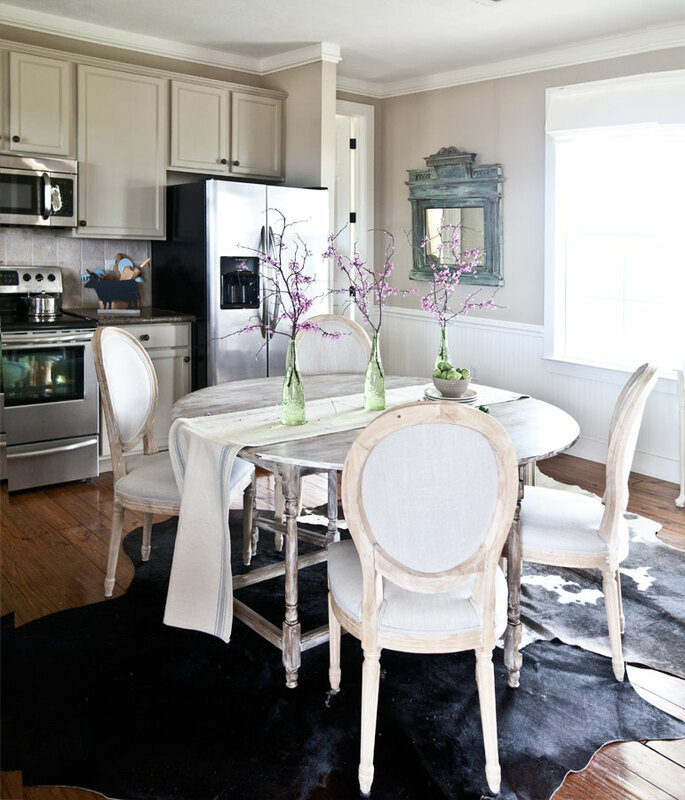 Love your blog about hide rugs! I’ve had a rusty-brown cowhide rug for years, and used it first in the master bedroom of my Arizona home. The rug was perfect with my Western decor! 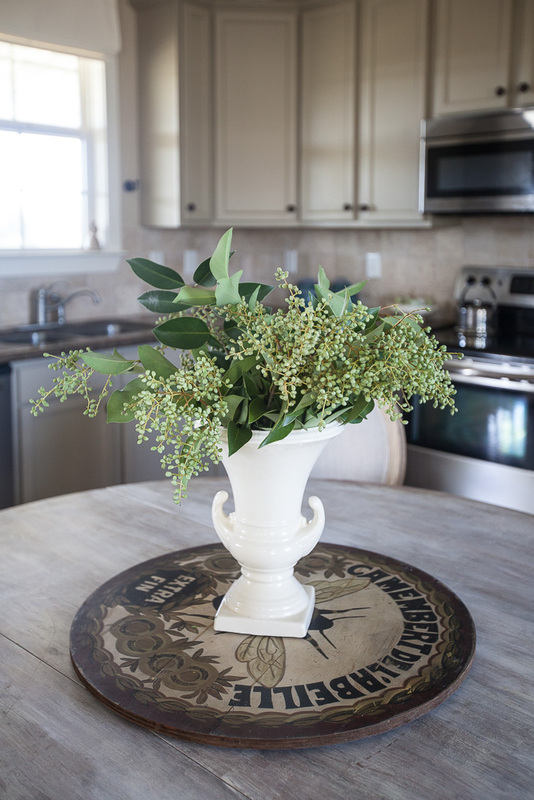 When I moved to the Midwest, I changed my decor to a combination of Country French and Tuscan…what I call European Country. The cowhide rug is now getting compliments in my guest room with its off-white carpeting, cinnamon-toned “Chez Michelle” furniture, and Country French inspired bedding. We have Chez Michelle by Lexington in our bedroom. I never thought about using a hide rug, but it sounds like you have made it work, Carole. Anita, your dog is adorable (and I’m a cat person). I LOVE cowhide anything…but with 6 kids and 2 dogs, I KNOW they’d always roll up and trip them and my hubby. I do want one for the back of my couch though. Your new one is absolutely beautiful! Thanks for the tip about dog hair! Amazing as always. Love your painted furniture. Wish my husband would agree to painting the Hickory White Asian stuff we’ve had for 30 years, I’m so sick of it I could scream but still in great shape. I’m trying to incorporate more European look to play down the Asian just so darn sick of it after 30 years. Whatever that wooden thingy is in the marble antique table picture – I want one! Can you share what colors you have used – the taupe/beige on top and the white on bottom? Oh the round bread board? I love those too Linda. What colors are you talking about? The wall colors? That is SW windsor greige and alabaster white. Yes the Windsor Greige and Alabaster White – going tomorrow to get samples – thanks so much!! That’s a big bread board! Love it. Just make sure the rug matches your dog! I love the justaposition of the rugs and the antiques! Gives a great informality to the space. Roxann the lazy susan on the table? I love that piece, but I’m not sure where you could find one now. I always think of my cats hair when I buy blankets bedding and rugs. Haha the things we do for the love of our animals. I love love love your story .all of the pictures are beautiful.your family is beautiful , your homes are beautiful .you are blessed to have found your dream . Yes you are so right, Cathy. Really great! Love the look and the advice. I have a chair covered in cowhide and in reading area of bedroom have a cowhide rug. Love both! The rugs actually work well in the photos you have shown. Who would have thought? Thanks for sharing a new idea! Makes me think about it I have my eye on one but nut sure of the wear thanks for sharing . I have never thought about using hide rugs before now. Love your look. I have my cowhide on the wall surrounded by European antiques and leather furniture. Works well. 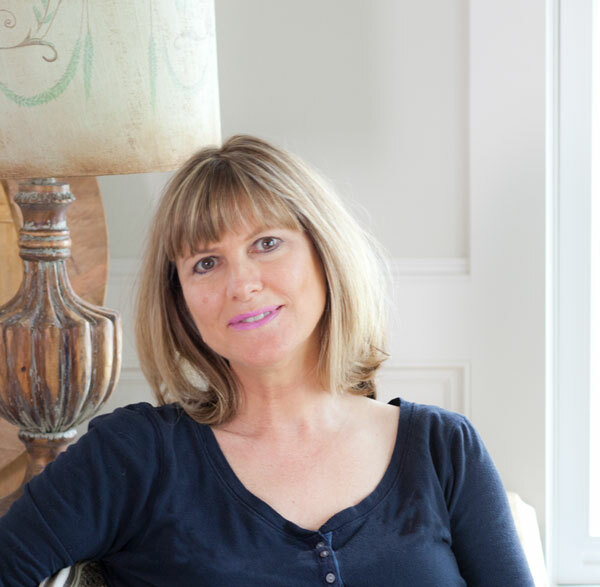 Like Terri, I would like to transition from Tuscan decor to Farm House French. Do you have any tips for a smoother (aka less costly) transition? Oh that’s a great idea for a post Hayley. I’m on it. I’ll try to do one soon. Doing the same thing Hayley! 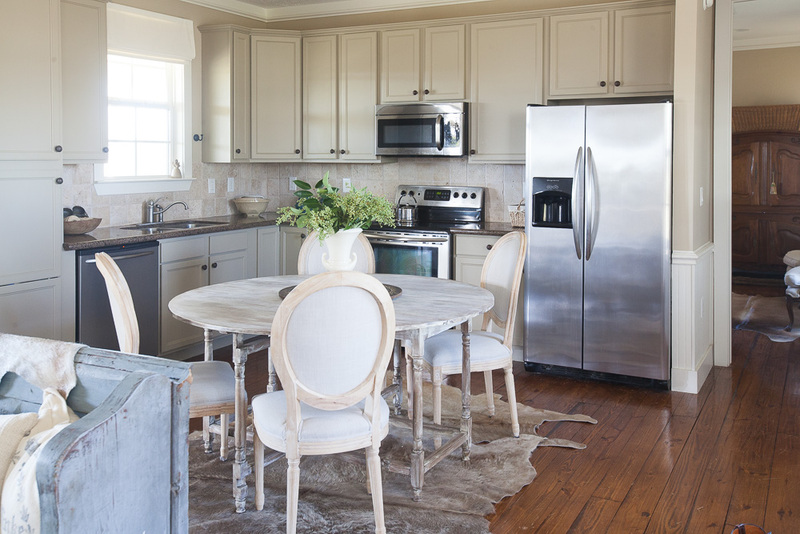 Getting rid of the Tuscan and going more to the neutrals and farmhouse. Tips for transition would be a GREAT idea for a post! I love the look of the hide rugs, but I am concerned with the edges rolling. Anita, do you have any tips for keeping the edges from coming up? Do you ever use any type of tape? Rosemary, I think you could use a tape on the underside. That’s actually a great idea. As an equine photographer,cowhide rugs hold great appeal for me. Your hide arrangement creates a new excitement in French country. And we always had Shelties so Molly equally made me smile. Thank you Dolly! It sounds like we like a lot of the same things. Forgot to mention the green berries,, love them and I have to find a four Chicken piece like yours. Do you have any information on the artist? Thank you again or sharing. I don’t. Next time I am at the farm, I’ll look for a signature. Well, I’ll admit it right up front: I am not a fan of cowhide or any other hide rugs. It just doesn’t appeal to me at all to have a part of an animal “decorating” my house. I feel the same about the antlers everyone seems to be using to decorate these days. You will never find either a hide rug or animal anything except my dog and cats in my house. But that’s just my preference–everyone has their own views and it’s okay. Yup it is a persona decision. I know it’s not for everyone. Some believe it is a way to honor the animal to use everything. I don’t think some people realize that leather is also from a cow. I feel the hides are a way to connect to the land and to honor the animals. I’m part Cherokee, so that might be why I am so drawn to them. Our farm is in cattle country. Hey, I love your cowhide rugs. I didn’t know they were almost stain resistant. 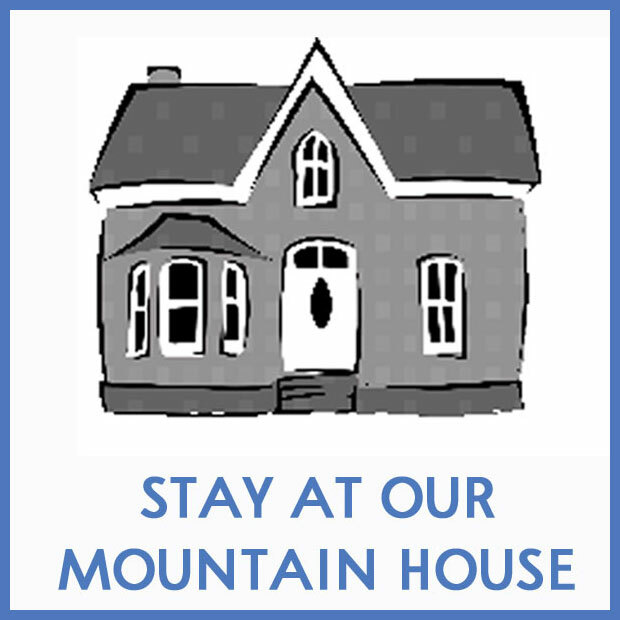 I will be on the look out now for some for my mountain house. Thanks. Maybe because I’m a country girl, and have lived nearly my whole life in Texas, I love hides. Maybe it’s the animal/nature lover in me as well. I have a few rabbit pelts that I’ve had for many years. More recently we have accumulated a few exotic deer hides…. is there anything you can recommend for use and cleaning with those ? They are so much smaller than cowhides, and I’ve been tempted to use them in upholstery, but just not sure how to go about it. Your input (or a blog post on the subject) would be very helpful! Hey Anita!!!! 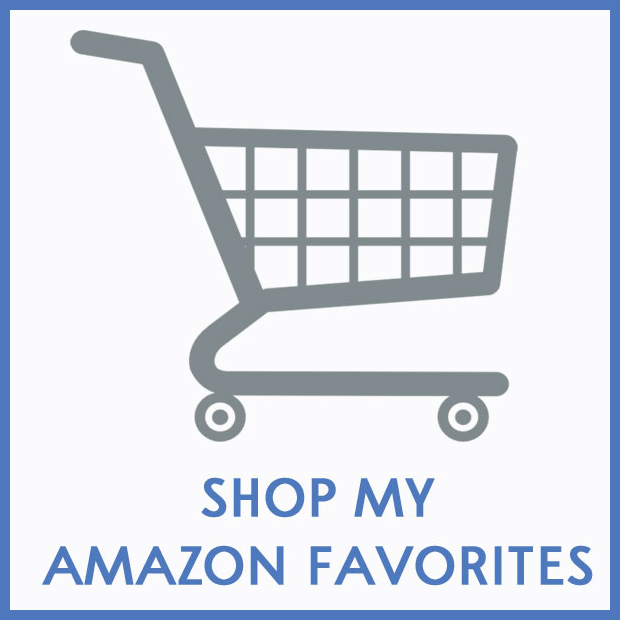 I loved your post on cow hide rugs! Our home is Southwestern/ Country and we have 3 cow hides in our home. One full size in the dining room, one full size in the living room layered over another rug and a small one in the hall way instead of a runner. They are wonderful! I agree about them being stain resistant, ours have been very durable. If you are looking for economical hides, try Ikea if you have access to one. Their hides are VERY reasonably priced. Thanks again for the post!!! Love your blog! 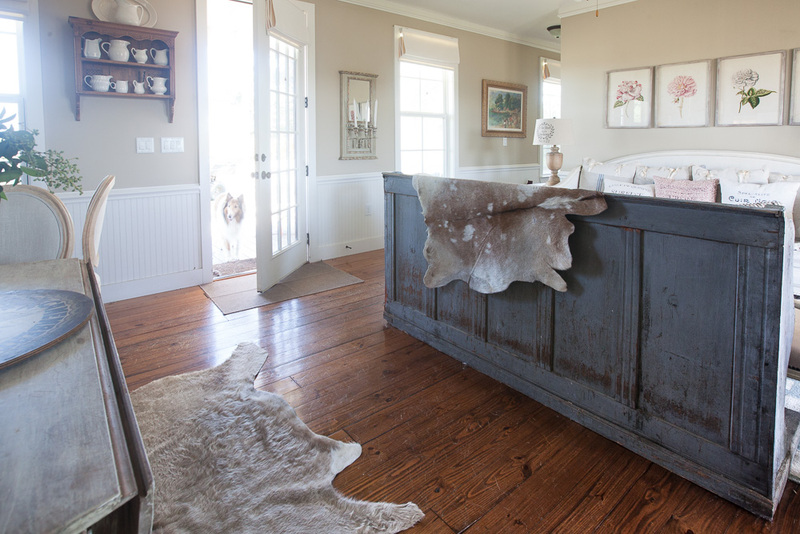 I really love the first few pictures of the cowhides as that is what I am wanting to do with my house. Currently, we just have a normal rug and I’ve been wanting to change things up. As you said, they do vary in price but I am more than willing to pay for something that makes my house look better!